RobVogt80s: Do you remember Carling Bassett? Carling Bassett gets ready to serve. Back in January I watched Canadian tennis player Genie Bouchard wage a heroic battle with China’s Li Na in the semi-final of the Australian Open. It was the first time in 30 years, and only the second time in history, a Canadian women’s tennis player had advanced as far as the semi-final in a Grand Slam tennis tournament. Few people could name the last Canadian, but I remember her well. It was Carling Bassett, and she brought a unique story of her own to the court. Back in the 1980s all the best women’s players were Americans, such as Christ Evert-Lloyd, Tracy Austin, and Pam Shriver, or moved to the United States and became American like, perhaps the greatest of them all, Martina Navratilova. Into this breach stepped a young, unknown Canadian. Many knew her last name, “Bassett”, because her grandfather had been a broadcasting titan, founding Baton Broadcasting which made up a good chunk of the Canadian Television (CTV) network, and her father who dabbled in professional sports ownership. He tried to bring a World Football League team to Toronto, and call it the Northmen, but he faced enough opposition that he instead located the team in Memphis and called it the Southmen. That enterprise failed, but Bassett was back in 1983 with the Tampa Bay Bandits, a team in the upstart United States Football League (USFL). Needless to say, the Bassett family cast a long shadow for the young Carling. Carling Bassett returns a serve back in the 1980s. Bassett turned pro when she was 15, and rose through the ranks through the decade. 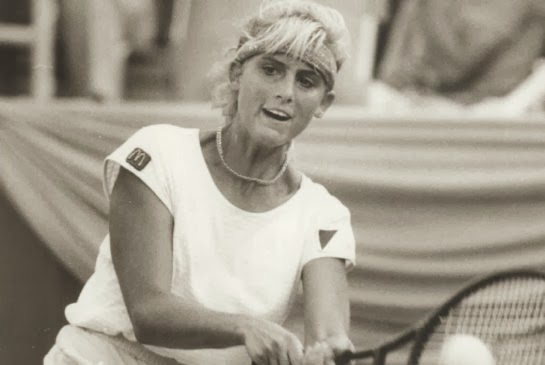 In 1981, she won the Canadian indoor title, and was ranked the number two junior player in the world. By the age of 16, she was Canada’s top tennis player. In 1983, Bassett made the quarter-finals of the Australian Open. She reached her greatest heights of success in 1984, when she reached the quarter-finals of the French Open, then hit the height of her career, advancing all the way to the semi-finals of the U.S. Open. She would reach the quarter-finals of the French Open in 1986, and that would be the last noise she made in the Grand Slam. She climbed as high as number eight in the world rankings. She was named the World Tennis Association’s Newcomer of the Year in 1983, exactly 30 years before Bouchard won the same honour in 2013, and Canada’s Female Athlete of the Year in 1983 and 1985. She retired in 1990. In 1998, she was inducted into the Canadian Tennis Hall of Fame. It’s funny how much play Bouchard got when she answered “Justin Bieber” to the question, which celebrity would she most like to date? Yet, in her day, Carling Bassett was on the verge of becoming a teen sensation of her own. That was fuelled in part by the fact her dad was a movie producer, and her grandfather owned CTV. Still, she was a cute blonde with personality and charisma. She modelled for the Ford Modelling Agency, starred in her dad’s 1982 movie “Spring Fever”, and in 1984 appeared in an episode of “The Littlest Hobo”. That would be like Bouchard appearing in an episode of “Saving Hope”, “Heartland”, or “Arctic Air”. I just can’t see it. 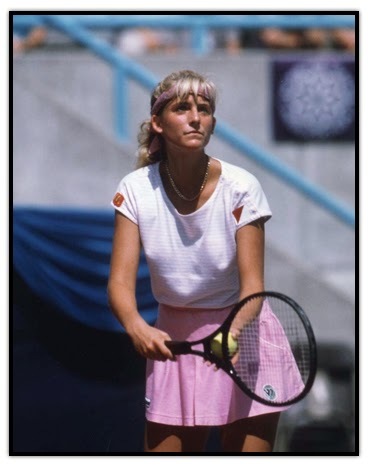 It was ironic that Christ Evert was in the broadcast booth calling the Bouchard-Li match, because she was the one who beat Carling Bassett in the semi-final of the 1984 U.S. Open. But it is likely no one would make that connection because here in Canada we so quickly forget. Carling Bassett may have been the greatest female singles’ tennis player this country produced, but no one knows it. But more than that, she was a celebrity. I have read her described as the Anna Kournikova of her day. We have to do a better job of celebrating – and remembering – our success.